The informal sector plays a significant role in many, if not all, low-income countries. Traditionally, as an economy grows, there would be a shift of informal workers to formal wage jobs. Yet, in recent years, many low-income countries have experienced substantial economic growth without dramatic formalisation of informal jobs. 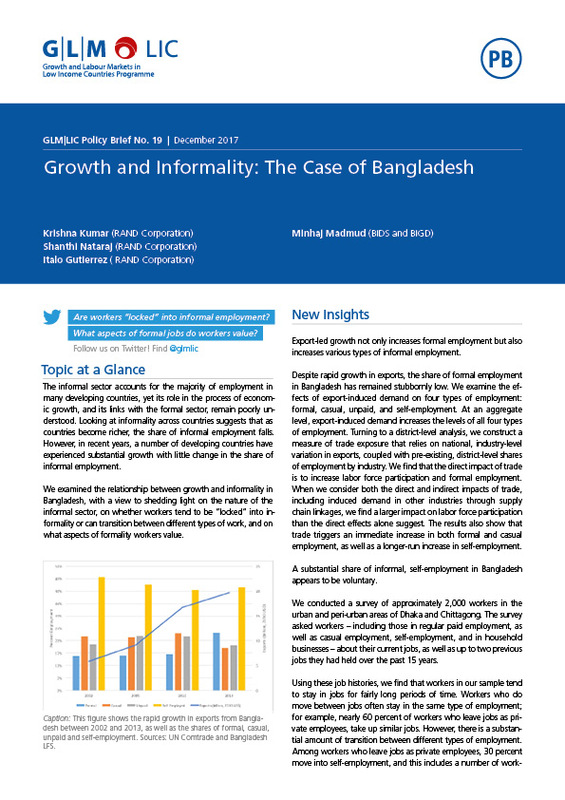 To better understand the relationship between the informal sector and economic growth, GLM|LIC researchers study various aspects of informal employment in Bangladesh: How would an export-led growth affect informal employment? Are workers voluntarily “stay” or are workers “locked” in informal sector? What benefit from formal employment do workers value the most? Find out the answers in GLM|LIC Policy Brief No.19 written by Krishan Kumar (RAND Corp.), Shanthi Nataraj (RAND Corp.), Italo Gutierrez (RAND Corp.) and Minhaj Madmud (BIDS and BIGD).